Last Saturday, on the 21st October, we celebrated the first ever International Repair Day, which will fall on the third Saturday of October every year from now on. We’re just getting started, and next year will be much bigger, including government, businesses, and media. This event hinted at the potential for a truly massive, global mobilisation for repair on 20 October, 2018. 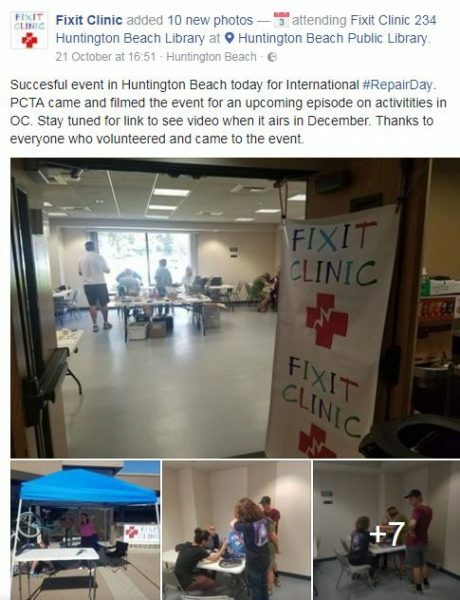 We counted over 65 events all over the world where people got together to fix their broken things or lend a hand to someone else. The global effort was boosted by a great concentration of Repair Cafes in Europe. You can see a map of locations on the Open Repair Alliance site. We also had people spontaneously share DIY repairs with us and repair businesses from the desert US, to Iran and Nigeria shared their work. In London, we held Restart Parties in Tooting and in Leytonstone. As always, not every repair was successful… But even if you don’t go home with a fixed item, at least you’ve got a diagnosis, and more importantly – new repair skills. In Argentina, the Club de Reparadores declared: “We will not take ‘broken’ as an answer!” They supported friends across the river in Montevideo, Uruguay to run a community event. ¡FELIZ DÍA INTERNACIONAL DE LA REPARACIÓN! Hoy, y todos los terceros sábados de octubre, celebramos el Día Internacional de la Reparación! ️ Los invitamos a sumarse a esta celebración anual que busca generar conciencia sobre la importancia de la reparación frente a la cultura de lo descartable en un planeta de recursos finitos. ¿Cómo? – Compartiendo una historia de reparación (exitosa o no!) en redes sociales con el hashtag #RepairDay #DiadelaReparación y sacando una foto con el póster que pueden encontrar en este link: https://goo.gl/wxYquC – Asistiendo a uno de los 36 eventos de reparación colectiva que habrá en paralelo en todo el mundo: https://goo.gl/EQRCN2 – Sumándote como voluntario a futuros eventos de reparación: http://reparadores.club/sumate/ – ¡Compartiendo este post! iFixit in the U.S. put together a great list of ways to participate – and even sticking to electronics repair, they don’t all involve getting out a screwdriver. The environmental cost of our electronics consumption is a global problem, requiring a global response. For Earth Day, we shout about the global issue of climate change and electronic waste while we recognise the power of repair to respond to these challenges. Marina, co-founder of Buenos Aires’ Club de Reparadores told us all about the state of waste, reuse, and repair in Argentina. Her “repair club” is inspiring hundreds and thousands of people to prevent waste.